Complex Grapher is a graphing calculator to create a graph of complex function. 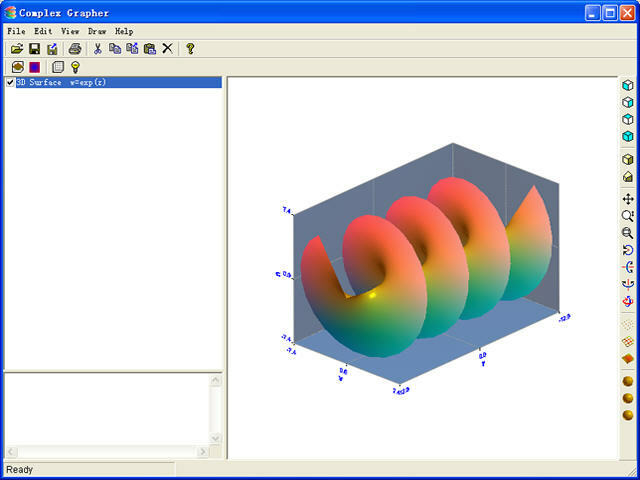 3D function graphs and 2D color maps can be created with this grapher. You can input complex functions in the form of w=f(z) (where z=x+yi) directly before creating graphs. Creating 3D graphs of complex functions. Creating color maps of complex functions. Complex Grapher is a graphing calculator to create 3D graphs of complex function. Visual Fractal - an interesting grapher to create a graph of fractal, and graphs of Mandelbrot set and Julia set. Function Grapher Standard Edition - Use Function Grapher to create 2D, 2.5D and 3D coordinate graphs, animations and table graphs. Geometric Constructions - The program includes 142 animations. Each animation provides detailed, step-by-step description of a straightedge-and-compass geometric construction studied in high school geometry courses. Systems of Nonlinear Equations - Systems of Nonlinear Equations is a software program for solving systems of simultaneous nonlinear equations. Linear Algebra - Linear Algebra is a software program for computations of matrices.